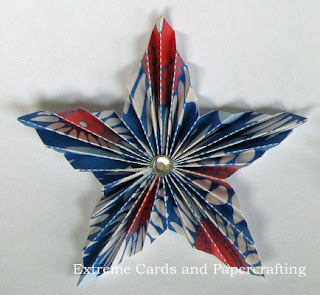 This accordion pleated paper star can be challenging because you feel like you need about 6 extra hands to hold everything in place as you glue it together. 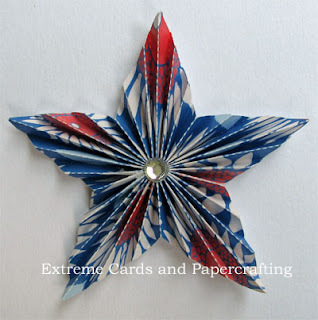 Use as a card embellishment or scale it up to make decorations for the 4th of July. Suitable for hand or machine cutting. Pay what you wish for the tutorial and to support this site. Download files. If you are hand cutting, score first, then cut. The score lines are 1/4" apart for those of you who have a score board. You will have two pieces to pleat, a large star that is the finished size (which is about 3"), and a small star and circle (use either as your backing piece). Glue together the two pieces using the glue tabs, forming a ring. Ring shown here, after pleating. The arrows point to the glued points. Pleat the star. To get the pleats going the right directions, start with the points. 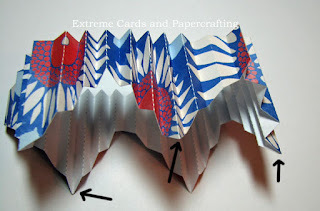 Pleat each of these as a mountain fold (the bump is up). Arrows pointing to mountain folded points. Next pleat each of the shortest pleats as a mountain fold. Accordion crease the pleats in between. 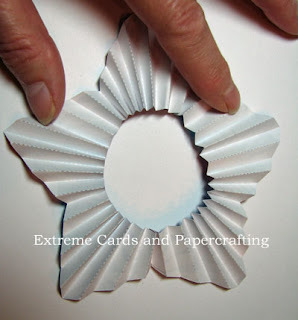 Spread glue generously on either the small star or the circle. Collapse the ring with the points to the outside. 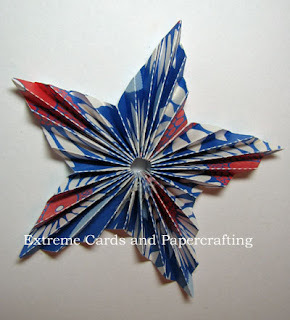 Affix the backing to the back of the star. 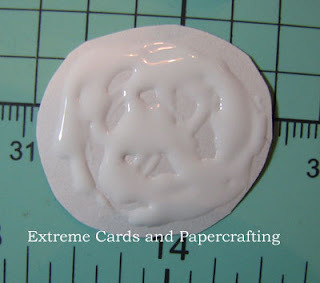 Continue to arrange the points to your satisfaction while the glue is wet. This is where an extra pair of hands is helpful. Use whatever you have lying around to the brace the star points, and put a small weight on the top of the star to help it dry flat. I like to add a small jewel to the center. 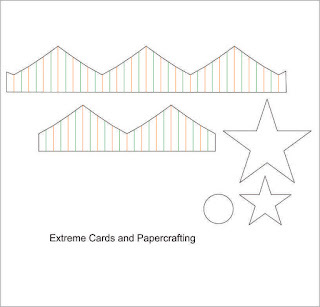 When a reader posted a card with a pleated heart to the Extreme Cards Facebook page I started thinking about how to draft a template for any shape. 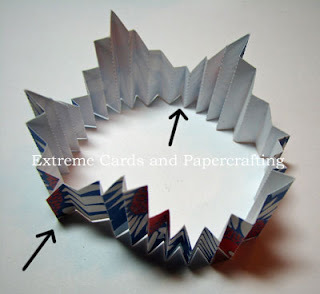 You could start with a pleated circle and, by brute force method, cut the shape and refine it, but there's a better way! 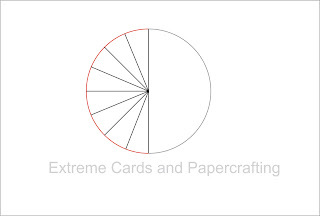 A pleated circle is made with a piece of paper that looks like this, a strip of paper with a series of score lines. Here is the key concept: the length of each score line is equal to the radius of the circle. Let me say that in a different way. The length of each pleat line is equal to the distance from the center to the outside edge of the shape. So, if you pleated the piece shown above, and held together the pleats at one end to form a fan shape, it would make part of a circle with the pleats like this. Okay, are you with me so far? Now let's look at the star. 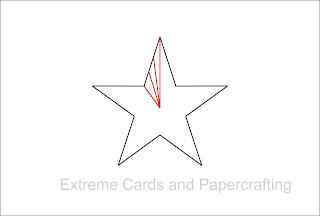 The line segments from the center to the outside edge are different lengths. 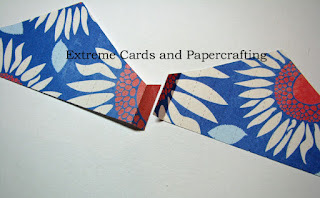 If you transfer those lines to the pleat base (1/2" wide rectangles), it looks like this. Each red line is the top of one pleat. That is, if these are your pleats ^^^^ the red line is the top of each. We will add the bottom of the pleats in a bit. 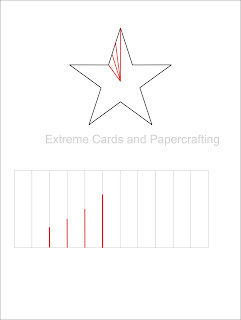 You can see that this pattern is half of one star point. By duplicating and mirroring it's easy to fill in the rest. Once all the red pleat lines are duplicated, draw a cut line by connecting the dots--the tops of the red lines, and then a horizontal line along the bottoms of the red lines. Halfway between each pair of red lines draw a green line. These are the score lines for the bottom of the V of each pleat. 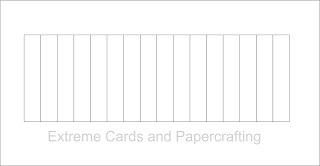 Divide template as needed to fit on the page, and add glue tabs. 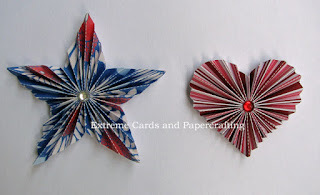 I've made a pleated star, heart, and flower so far. Heart template in the next post!